Eric, who grew up in Cullercoats in North Tyneside, is the North East’s very own world champion after being declared the winner of the World Fly Cup Competition, which involves training “tumbling” or “rolling” pigeons. 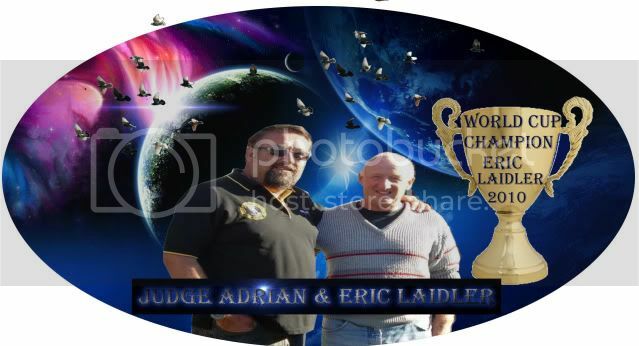 PIGEON man Eric Laidler is on a roll – and it has landed him a world title. Way to go, and good luck in the future. 10:37 AM Congratulations on a Great Accomplishment Eric. 7:22 PM Job well done Mr. Laidler. Must of been rather tough beating out all the competitors. 9:14 PM Congratulations from Northern Cali Mr. Laidler and much success in the future. I hope one day I can see what it feels like to be on the top. Good job again. Before you close this site, I would like to ask you how you found the artickle in the Journal, it took me by surprise to see it turn up on your site. 5:55 AM Hey Eric, I found it through Google. Nice article and congratulations! Thanks,as I said, I didn`t expect it so it had me wondering, thanks again. 9:13 PM Heine Bijker was almost 4 times champ. fou, Heine was thwarted this year but it is just a matter of time before he do`s succeed, he has the birds to make it 4,5 or 10 times, it is up to everyone else to breed and fly better birds. I know this is not the right thread but I would just like to say that despite what some fanciers on this forum might say, the hawk problem in Europe is just as big as what it is in the US, the fanciers who fly their breeders also lose them to the hawks, there are other weather conditions that can ruin a good kit of rollers on the day, not just heat, over the years I have lost hundreds of birds including breeders due to the sea mist which can drift in over the houses but I do not complain, I just get on with the job of rebuilding my stock. just keep on trucking through what nature puts in your way.